The energy was high at Aji last Sunday for their September Regional Prix Fixe menu, a three-course Mexican delight designed by Executive Chef Jaime Martinez. Aji, of course, has been a prime spot on the East Pearl axis for some time, and has made a name for itself as one of the top Latin fusion restaurants in town. With their monthly regional specials, they are doing a deep dive into the cuisine of one area at a time, a great idea for a kitchen that normally covers so much gastronomic ground it can sometimes be difficult to appreciate the basics. When Three Leaf Concepts reached out to us to check out the program, I jumped at the offer. This month the focus was on Mexico, Martinez’s home country, and he was clearly drawing from his family roots for inspiration. As he told me and my companion when he stopped by our table, he is driven by a desire to take the traditional dishes he grew up with in Zacatecas and neighboring areas of Mexico and “make them my own.” That meant the sope, a thick cornmeal cake usually topped with tomatoes, beef or even roasted grasshoppers (! ), was here served with a spicy braised boar, a fiery salsa charra and a healthy scattering of queso a mano crumbles. Cornmeals must be served fresh for proper taste and consistency, and this dish was superb, spicy without being overbearing, and intriguing throughout. In truth it was so good, it set the bar unconscionably high for the following two courses. While the sope originated in Culiacan, the algo leve (light course) featured more directly Zacatecan dishes, and here Martinez stuck closer to tradition. The chicken noodle soup (sopa de fideo) was a satisfying if less-than-interesting tomato-heavy broth, and came with an excellent jicama-avocado salad, and an inventive romaine-stuffed chile pepper. 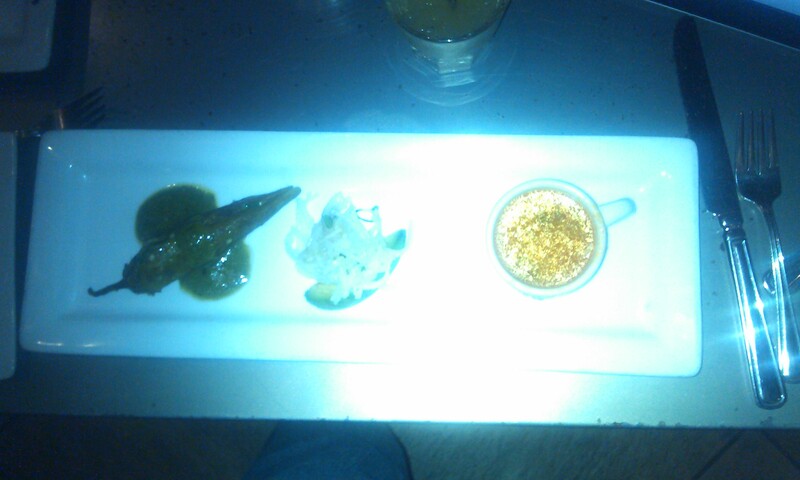 The trio of tastes, artfully presented on a long dish, was a pleasant repast, made even more so by the light and citrusy “Paloma” tequila cocktail, with the distinctive touch-of-bitterness from fresh lime juice. For the main entree, Martinez drew from Southern Mexico, and offered roasted quail with mole, along with a braised apple & sprout salad and a rice enchilada. 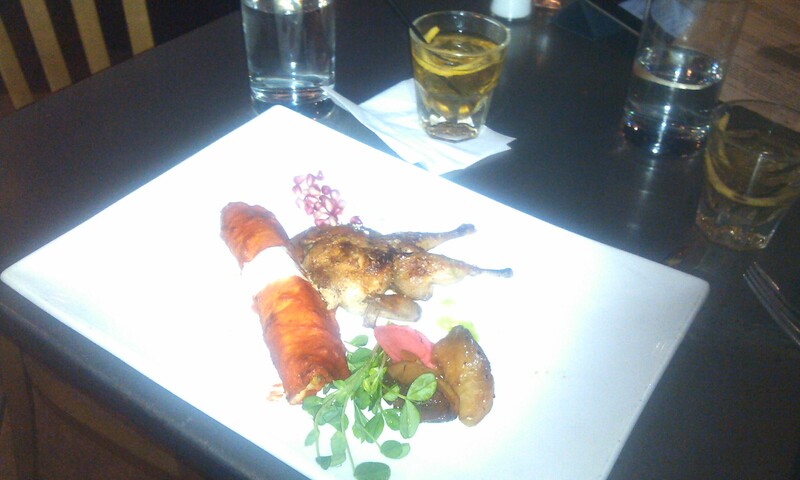 To my unfamiliar palette (my sister got the sweet tooth and I’ve long avoided moles), the quail was excellent, with strong hints of nutmeg and cinnamon. My companion Taya, a former resident of Mexico, enjoyed the dish as well, although she claims a mole “is supposed to overwhelm you”, which this dish, perhaps respectfully, did not. The pickled fruit salad side was superb. I mentioned the high energy at this event, and I am sure it was mostly generated by the quality of the meal and Jaime’s clear love for his tradition and his craft. (Our server Nick did a fantastic job pleasantly fielding our questions while juggling many other tables on a busy night.) Also fueling the cheer was matching drink flight that paired a tequila cocktail with each course: a blanco margarita to start, a reposado cocktail with the soup and an “extra anejo” (left in the cask longer, so I am told) with housemade curacao for the mole. All the drinks were tasty and happy-making, their sweetness joining the theme of the evening. All in all, Aji and Martinez did a great job of avoiding the main pitfall of “fusion” restaurants which overload incompatible tastes in the interest of “creativity” (I’m talking to you, Rootdown.) In this meal, they brought new tastes to traditional dishes that complimented the core meal and made for an inspired evening. Aji re-started their regional meals this summer, with Mexico following Argentina (last month). Still ahead are Cuba (Thursday, October 25), and Brazil (Thursday, November 29). Both will follow the same format with a prix fixe three course meal for $35 and wine/cocktail pairings for $18. All dishes will also be available ala carte on the day of the special as well as through the following weekend. If Aji’s “new tradition” holds, they will be well worth checking out. Photos courtesy of Taya Irizarry and sorry the flash was misfiring that night!